Why is the G12 antibody so uniquely suited to gluten detection? The GlutenTox line of test kits is powered by the G12 antibody, which was developed by Biomedal in response to the growing body of research surrounding gluten and gluten toxicity. While you certainly don’t need to know anything about what makes the G12 antibody special in order to use GlutenTox to detect gluten contamination in foods, we know some of our readers are always glad for additional information. Emport is pleased to share some details from Biomedal regarding the G12 antibody, specifically developed to identify the 33-mer peptide of α- gliadin – we hope you enjoy! 1. What peptide sequence does the G12 antibody recognize? The G12 antibody was raised against the highly immunotoxic 33-mer peptide of the α- gliadin protein that induces celiac disease (Morón et al., 2008). More specifically, the region of recognition within the 33-mer is the hexameric epitope QPQLPY. This recognition sequence is repeated three times within the gliadin 33-mer peptide. The G12 antibody recognizes immunotoxic prolamins from wheat, barley, rye and also from some varieties of oat (Morón et al., 2008). The G12 antibody is also capable of reacting to other epitopes that are found in other toxic prolamins as QPQLPF, QPQLPL, QPQQPY, QPQQPF (Moron et al. 2008; and Real et al. 2014). 2. Is the G12 antibody reactive only to the 33-mer of the α-gliadin? No it isn’t. The G12 antibody can react to similar sequences present in other gliadins (omega, alpha, gamma and beta) and also in glutenins. The recognition profile of G12 has been largely characterized. (Morón et al., 2008a, Morón et al., 2008b, Real et al., 2014). 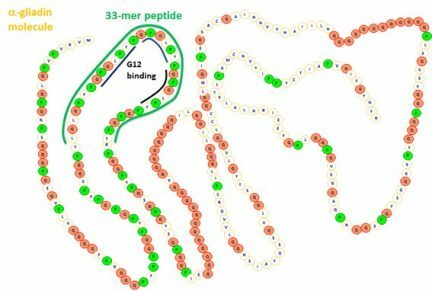 There are other peptides that could be reactive to G12 that are found in immunogenic peptides of wheat, barley and rye: QPQLPY, QPQQPY, QPQQPF, QPQLPF, QPQLPL, QPELPY. 3. Is G12 able to detect gluten in beers and other hydrolyzed material? In hydrolyzed materials such as beers, the relative proportion of reactive peptides for celiac patients may differ, because of the diversity of the resulting peptide populations after fermentation. In a publication a few years ago (Comino et al., 2012), a wide variety of beers were analyzed with two different methods based on the G12 antibody (Competitive ELISA and lateral flow immunoassay) with similar results. Later (Real et al., 2014) a beer legally labeled as gluten free (undetectable level of gluten by Competitive ELISA R5) was shown to contain gluten peptides determined by ELISA G12 and by Mass spectrometry, which identified immunotoxic peptides for celiac patients. This was shown by exposing cells of the immune system of celiac patients to these peptides and measuring their response. A more recent study (Picariello et al., 2015) analyzed samples of Weissbier (wheat beer) and detected immunotoxic epitopes with G12. They analyzed these beers with sera of celiac patients as a source of antigliadin antibody, confirming that the wheat beer contained peptides with reactivity with sera from celiac patients. That being said, beer remains one of the most challenging matrices for gluten detection and underrepresentation of gluten is still possible. Current FDA regulations do not allow for any beer brewed with gluten-containing grains to be labeled gluten-free, regardless of fermentation procedure or test results. 4. There are more than 1000 gluten peptides known as immunogenic. Does G12 recognize all of them? Detecting all these peptides with a single antibody is almost impossible. However, a recent study (Moreno et al., 2016) has shown that the most immunogenic peptides (responsible of 80-95% of immunoreactivity of celiac T cells) reacted to G12. In contrast, a widely used antibody in gluten detection, R5, only recognized around 25% of these immunogenic peptides of a barley beer. The correlation between G12 reactivity and T cell immunogenicity has been largely studied in several difficult-to-analyze foodstuffs, such as pure oat varieties or barley varieties (Comino et al., 2011, Comino et al., 2012). 5. Are oats safe for celiac patients? Are they really gluten free? Oats are often subject to cross-contamination (in the field and/or during the manufacturing process). However, even if the oat has been grown and processed carefully, this does not mean that it is always considered as a gluten free food. A study from the year 2011 (Comino et al., 2011) showed that not all oats are equal in gluten immunogenic peptide content. All varieties of oats contain avenin, but each one with a different sequence and structure. Only some of these varieties could be a risk for celiac patients. The gluten from the oat varieties were exposed to cells from celiac patients, and the cells responded appropriately: they only reacted to the potential immunotoxic oat varieties. Therefore, the G12 antibody is the best choice for any company that works with gluten-free oats. Other studies (Real et al., 2012; Comino et al,. 2016, Silano et al., 2013) have further characterized the differences of these oats and their immunogenicity. In any case, the wheat gluten always contained at least 40-fold more reactivity to G12 than the most reactive oat variety. The proportion of oat varieties that can cause problems for celiac patients may be very small; it may be that only the most sensitive celiac patients may be affected by only the most reactive oat varieties. Future studies will clarify the threshold level of oats with gluten immunogenic peptides to impact in celiac health. 6. What method do most manufacturers use to determine food safety and validate sanitation protocols? GlutenTox® Pro holds AOAC certification for detecting gluten in foods and on surfaces, license number 061502. Validation studies showed no cross-reactivity (false positives) and no false negatives, as well as 100% specificity and 100% sensitivity for food testing. The GlutenTox®Pro test kit is a quick and easy to use screening method for the detection of gluten in raw or cooked foods and on environmental surfaces. The method is specific and reliable and provides sensitive and accurate test results. The GlutenTox®Pro test kit performed as expected in the selected foods and has been validated against more matrices than any other kit available. The kit was also validated against several environmental surfaces, demonstrating 100% specificity. “Diversity in oat potential immunogenicity: basis for the selection of oat varieties with no toxicity in coeliac disease”. Comino I, Real A, de Lorenzo L, Cornell H, López-Casado MÁ, Barro F, Lorite P, Torres MI, CebollaA, Sousa C. Gut 2011 Jul;60(7):915-22. “Molecular and immunological characterization of gluten proteins isolated from oat cultivars that differ in toxicity for celiac disease”. Real A, Comino I, de Lorenzo L, Merchán F, Gil-Humanes J, Giménez MJ, López-Casado MÁ, Torres MI, Cebolla Á, Sousa C, Barro F, Pistón F. PLoS One 2012;7(12):e48365. “Identification and molecular characterization of oat peptides implicated on coeliac immune response”. Comino I, Bernardo D, Bancel E, de Lourdes Moreno M, Sánchez B, Barro F, Šuligoj T, Ciclitira PJ,Cebolla Á, Knight SC, Branlard G, Sousa C. Food Nutr Res. 2016 Feb 5;60:30324. “Significant differences in coeliac immunotoxicity of barley varieties”. Comino I, Real A, Gil-Humanes J, Pistón F, de Lorenzo L, Moreno Mde L, López-Casado MÁ, Lorite P, Cebolla A, Torres MI, Barro F, Sousa C. Mol Nutr Food Res. 2012 Nov;56(11):1697-707.